The new year’s Sunday Afternoon concert series at the California Jazz Conservatory continues on March 25 with a program of medieval Spanish and Arabic music from Flauti Diversi. 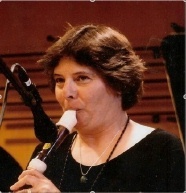 Musical Director Frances Feldon and the group have presented a variety of programs at the CJC, many of which feature the intersection of different musical traditions. Flauti Diversi was founded in 1992 by artistic director Frances Feldon and has been presenting early/contemporary chamber music programs for the past quarter century. Over the past four seasons, Flauti has focused on presenting early repertoire of the 13th to the 18th centuries from the Mediterranean. Flauti has presented several exciting sold out shows at the CJC. This year’s program includes songs and dances of the 13th and 14th centuries, both monophonic and polyphonic, devotional and rowdy, from the Cantigas and Llibre Vermell manuscripts, laude and estampies, as well as Arabic repertoire.​ Performers are Frances Feldon, recorders and medieval flute; Allison Zelles Lloyd, soprano and medieval harp; Peter Maund, percussion; Sarah Michael, qanun; and David Rogers, lute, guitar, and oud. The concert begins at 4:30 p.m., at the California Jazz Conservatory (formerly The Jazzschool), 2087 Addison St., between Shattuck and Milvia, in downtown Berkeley. The venue is one block from the downtown Berkeley BART station, and parking is easily available at the Addison Street parking garage. Street parking is free on Sundays and also relatively easy in the afternoon. Doors open a half hour before the performance. The school’s café will be open prior to and during the concert, allowing audience members to enjoy a glass of wine, coffee, or a light snack. Reserve your tickets online. Admission is $20, and reservations are highly recommended for this small and intimate venue. Tickets will be available at the door, but performances often sell out.